On the verge of Nowrouz, Hengame speaks with the Eshaghi brothers of Koobang Ensemble. 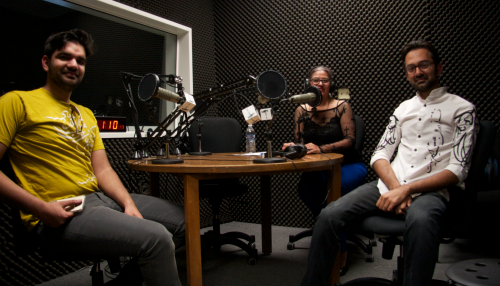 Farsi show with Hengame Abassi is a show that focuses on the local Farsi speaking community. On this episode of the Farsi Show, Hengame Abassi interviews composers Misaq and Matin Eshaghi of Koobang Ensemble. Misaq sings, plays kamancheh and the daf drum. Misaq studies Music Industry at CSUN, and teaches traditional Persian music instruments. Matin sings, and plays the taar, daf and tombak. Matin began learning the tombak at age three, and has continued making music ever since. Koobang Ensemble will be performing at Pierce’s own Persian Club celebration of Nowrouz on March 21 in the Great Hall, which will go from 6 p.m. to 10 p.m.
You can find Koobang Ensemble on Facebook and Soundcloud. Follow Hengame on Facebook for updates on future guests and appearances.